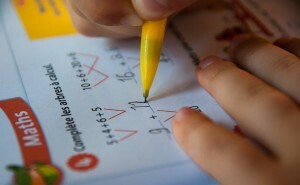 Calculators can interfere with your young child's math learning process. To find out how you can introduce calculators to your child, read this post by The Tutoring Center, Frisco TX. Calculators can be very useful tools. However, if your child is new to math, using a calculator can get in the way of their learning process, since they can become too reliant on it, which will hinder the development of their math skills. A question arises at this point "should students use a calculator for elementary-level math?" While opinions may differ regarding this issue, here are a few tips you can follow in case you choose to introduce calculators to your child. Call The Tutoring Center, Frisco TX at (469) 980-7940 to enroll your child in one-to-one math tutoring in Frisco TX to help them become a successful mathematician. First things first: your child shouldn't come near a calculator if they don't know some basic math (concepts and operations) first. They should be able to do additions, subtractions, multiplications, and divisions (even long ones), comfortably and well before you introduce them to a calculator. Moreover, you should let them know why they need to learn to do math on their own. Doing so will guarantee that the use of a calculator won't get in the way of their learning process and won't become a crutch that they rely on too heavily to perform basic math operations. Another thing to consider before your child starts using a calculator is that they should be able to do calculations with other tools, so they can exercise their math skills and develop them enough before they use the computer. Nowadays, your child has a variety of materials that they can employ for that purpose. For example, an abacus can allow them to move beads back and forth in order to do basic math operations. Providing a blank piece of paper and a pencil can also help them in this respect. One thing to keep in mind, however, is that you shouldn't let your child use their fingers to count, sum, subtract, etc. This is because they can also become too reliant on them, which could also hinder their learning process. Children can be very receptive, which means that if you simply talk with them about this subject, it's likely that they'll listen to you and that they'll follow along with what you have to say. To that end, tell them that they need to employ their calculator responsibly. After all, there can be serious consequences if they depend on it too much. For example, let them know that there will be some occasions where they won't be able to use it at all (like when they're answering a math test), so they can understand why they should do math on their own. Moreover, when you talk to your child, they will feel respected and considered; this will make them more eager to listen to you. If your child requires assistance with their math goals, enroll them in tutoring in Frisco TX. Call The Tutoring Center, Frisco TX at (469) 980-7940 to request a free diagnostic assessment. As you're probably aware, there are a myriad different types of calculators in the market. For example, there are basic, standard calculators (the ones we all know), scientific calculators, graphing calculators, and financial calculators. But, unless your child is a math wiz, they're better off with a basic calculator for now, so provide it for them. If you give them a more complex calculator, you can confuse them and derail their efforts of learning math successfully, so avoid it. Before you let them use it, however, teach them about its buttons and how they can use it correctly to do their math operations. As a final tip, it's important that you set some limits regarding your child's calculator usage. For example, set a rule in which they can only use their calculator after they're done working on a math operation on their own. This way, the calculator will help them verify if the work they did was correct. This will give them a chance to inspect their work, correct their mistakes, and learn math successfully without depending on their calculator. Call The Tutoring Center, Frisco TX at (469) 980-7940 to enroll your child in one-to-one tutoring in Frisco TX, and to learn more about their academic programs.